Be cautious with weed and feed products. by Tim Ray (Harrison Co. Extension Agent). “In a 2014 newsletter that I send out bi-monthly called “From the Ag Department” I stated reasons to be cautious when using weed and feed products. Unfortunately, there’s another reason to be cautious. The “new” formulation of some weed and feed products can cause turf damage depending on either turf type, amount applied, timing of application, or any combination of the three. The former active ingredient in many of these products, Atrazine, is being replaced with Metsulfuron. Metsulfuron has its advantages in that it controls more weeds than the previous formulation, including Dollar Weed, however, we are seeing problems with this new formulation. I have received several phone calls this year with concerns about how a particular lawn is looking only to find out that a good many of the lawns have a lot of Carpetgrass. While St. Augustine, Centipede, Zoysia, and Bermuda are ok for this new active ingredient, Carpetgrass and Bahia are not so decline or death may occur. Homeowners may not even realize they have Carpetgrass until after they’ve applied products containing Metsulfuron. 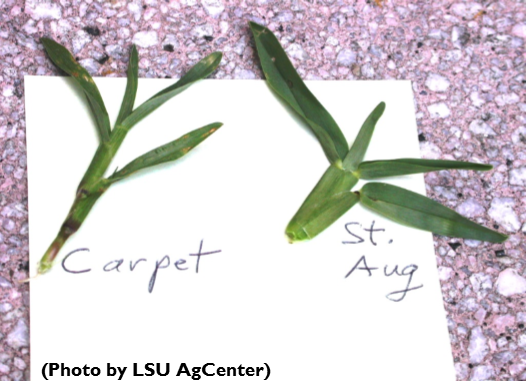 In a recent visit with Dr. Jay McCurdy, Turf Specialist with Mississippi State University Extension Service, Dr. McCurdy noted the amount of Carpetgrass we have here on the coast. He also stated that many people throughout Mississippi are using this new formulation at the wrong time and/or at the wrong rate causing decline in either Centipede or St. Augustine. The label on one product states not to apply the product until after the third mowing but too often is being applied during lawn green-up. One must also keep in mind the size of their lawn before the application. More is NEVER better! It has been suggested that this product should be applied at or below normal label recommendations to Centipede or St. Augustine. Companies do change formulations from time to time so it’s good to always check the label on the products you purchase, even if you’ve used it in the past to prevent damage to you landscape. Read the label thoroughly and understand it. Know your grass type before purchasing any product. My lawn in the Goose Creek area of s.c. has been damaged after i put down scotts bonus s.
Every Spring, I use Scotts Bonus S for my lawn and yard. I used a 5000 sq ft bag and a 10000 ft bag. My yard is dead now and I’m at a loss. I live in Red Hill section of Conway SC. Help!!!! I have a bag of Scotts Bonus S for Southern Lawns Weed and Feed fertilizer. Bag was purchased 9/1/14 and has been opened with about one-half unused. UPC is 0 32247 03313 8. I applied this on my back yard last year and I have lost much of the grass in that yard. Am I eligible for a refund? I purchased this at Lowes and with some trouble may be able to locate the receipt. Thank you for your advice. Did you recive a refund from last year? 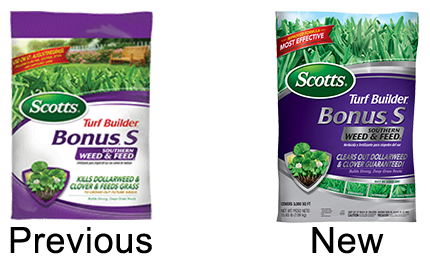 Hello – I also purchased the Scott’s Bonus S Weed & Feed product and applied it to my Centipede grass, although it is the original formula. But guess what?! That product killed my grass as well! I have spoke to Scott, and they are reluctant to do anything. I know I followed the application directions (except I used a hand-held spreader & the label says to use a Rotator, or Drop unit). This is not a problem, as using a Rotator, or drop applicator unit is mostly for a safety reason, not that they apply product that much differently. I have spoke to Scott, and they said for me to send them all of the information they request, and they will “consider” if there is anything they can offer. Will post again after all is said and done.